Before you buy a parrot to have it at home, it is important to keep in mind that, although there are many people who have them, parrots are not birds that are prepared to be domestic pets. Even though we have raised them from a small age, parrots present primitive and savage behaviors. For this reason, you should know that the care we must lavish on parrots is very special. In this sense, it is essential that they have a suitable environment so that they feel comfortable and locked in a cage does not end up causing them a high degree of anxiety and stress. We must choose parrots that have always been bred in captivity so that their level of aggression is less. But also, you have to bear in mind that parrots are sociable animals, so it is important that they have company and that we place the cage in that stay where we will spend more time. If so, everything will be much more fun. On the other hand, it is highly recommended that they have accessories for birds in the cage with which to entertain, so that we reduce their level of anxiety and encourage their learning. Parrots are very restless and curious birds that need to be active in order not to be bored. The best toys for parrots are those that can handle easily and that are not too big to have enough space to move inside the cage. But not too small to be swallowed or potentially dangerous. Parrots nibble all they have at their fingertips to see what the object is, so it is most advisable to buy toys in specialty stores where we can buy the right accessories. The most frequent are the bells, the swings, the wooden stairs or the ropes, but there are many more. In any case, remember that it is always better to be of natural materials and not to be dismantled to avoid swallowing small parts. 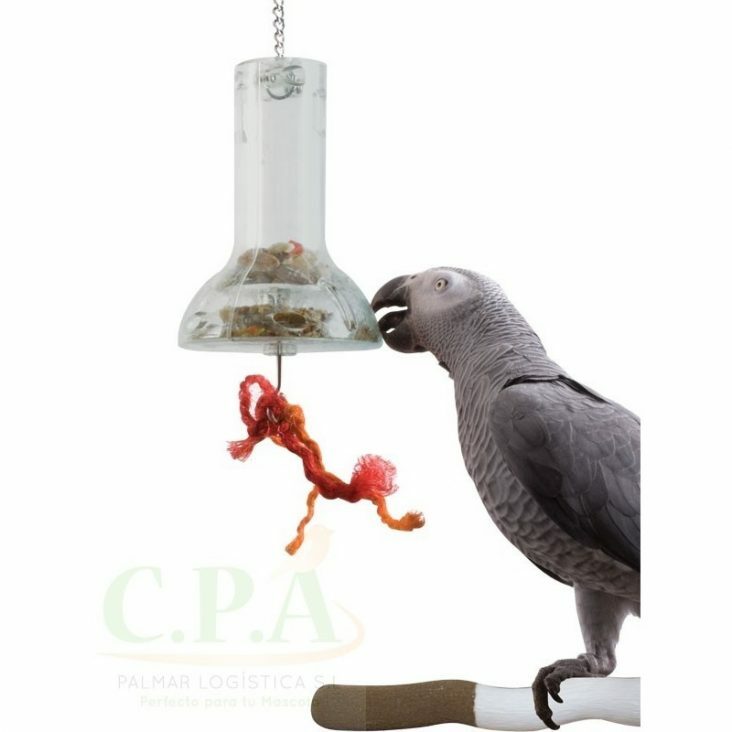 The cotton spirals are an ideal toy to place both inside and outside the cage, hanging from the ceiling like a playground so that the parrot can enjoy controlled freedom. The parrot will be able to sway on the swing all you want and enjoy hours of fun in a completely safe way. Thanks to this perch, you will no longer have to file or cut your parrot's fingernails anymore. Every time your parrot poses on it they will be sucking them, keeping their fingernails in a perfect length and the rounded ends. A fun toy that combines large pieces of wood with jewellery chains that ends up in a lot of bells. Guaranteed fun time for your pet. The interactive Bell is a fun toy, as it can be filled with your favorite food. The parrot has to learn to pull the bottom spring so that the food descends until it can access it. It can also be wheel-shaped with five different compartments, so you must turn the front cover to reach the prizes for the two holes you have. Definitely a very interesting toy to develop intelligence and offer fun to our pet. Interactive cabinets are also a very interesting option. They have drawers where you can hide food that the bird should open in order to take the prize. Ideal for all kinds of parrots. It is a novel handmade flower-shaped toy that is ideal for both small and medium sized parrots. With volcanic rock at the bottom that will allow you to have the peak in perfect condition. It is a fun haven that offers a high level of comfort to your pet, fun hiding places and numerous surprises and toys. Perfect for small parrots. The abacus, besides being a very funny toy, is perfect to encourage learning and develop the intelligence of your parrot. It is made up of numerous hoop-and ball-shaped pieces attached to the rods. This hanger is perfect for hooking pieces of fruit or whole pieces without dropping or staining the bars of the cage. It allows the bird to give comfortable snacks to the food, simulating the way in which it would be released.